On Forgiveness Sunday many attend Forgiveness Vespers on the eve of Great Lent. They hear on the Lord’s teaching about fasting and forgiveness and enter the season of the fast forgiving one another so that God will forgive them. If you forgive men their trespasses, your heavenly Father will forgive you; but if you do not forgive men their trespasses, neither will your heavenly Father forgive you your trespasses (Matthew 6:14). Now we are at the last day of the threshold before Great Lent. 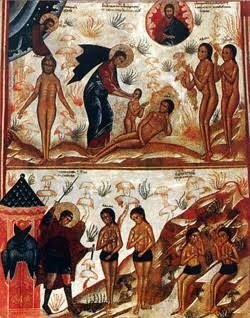 On this day, the Church remembers the terrible tragedy that happened to mankind at the dawn of its history—its expulsion in the person of our forefather Adam from the face of God; the expulsion of Adam from paradise. The vale of tears and sadness—the earth—received the outcast, so that at God’s commandment the transgressor would reap thorns and thistles, so that he would eat his bread in the sweat of his brow, so that in pain, tears, and sadness he would give birth to his children and feed them, so that he would reap all the bitter fruits of his disobedience to the Heavenly Father. Adam wept in his exile, sitting “outside of paradise”; he wept, remembering what he was, what he possessed, and Who he lost. To this day, all mankind weeps and sighs over the first Adam, over the now elusive phantom of happiness. The whole world, harassed and weary, weeps because of its waywardness, because of its naked soul; because life is aimless and joyless. Nothing can fill our life so that we might unconditionally feel the fullness of true—not phantom—happiness; for this fullness is only in God. But we are exiles. Paradise is far away, and the farther mankind lives from the time of the fall, the more shadowy that beautiful image of paradise becomes in him, the deeper is mankind’s pain and suffering, and the more the image and likeness of God is erased from his soul. The world would have perished long ago, had not the Second Adam, Christ, not reopened locked paradise and given man the opportunity to return to it. We now bear the weight and sorrow of the life of an exile. Even we, who live the life of the Church, know also the paradisal joy of the open Royal doors, and the life-creating, jubilant words, “Christ is Risen!”; in them is the original nearness to divine love for man. But preceding this paradisal joy on earth is Great Lent, and the Church continually teaches that what we have lost through sin, we can find and regain only through repentance, podvig, and ascetic labors of great temperance. Just a few hours will pass, and we will all notice with amazement that something will change around us and within us; something will happen that will place a seal of particular concentration and attention upon everything. And along with the Church, we must pass from the call to repentance to the very labors of repentance, to the work of repentance. Our Mother-Church received the Lord’s commandment of the healing fast, which could be heard in Old Testament times for the people of God through the Prophet Joel: Now therefore, saith the Lord your God, turn to me with all your heart, and with fasting, and with weeping, and with lamentation… sanctify a fast, proclaim a solemn service … assemble the elders… and all the inhabitants of the Lord’s house, Let the priests that minister to the Lord weep, and say, Spare thy people, O Lord, and give not thine heritage to reproach… (Joel 2:12, 15, 16, 17). The Second Adam, Jesus Christ, began the path of His labors with a great forty days fast, so that by His divine love for fallen man He might open again locked paradise and show the way by which man may return to it. The Holy Gospels testify that, Then was Jesus led up of the Spirit into the wilderness… And when he had fasted forty days and forty nights, he was afterward an hungered (Mt. 4:1–2). And the devil came to Him and tempted Him. Great is the audacity and blindness of the dark power. Having made progress in tempting man in paradise, it began to war against God unto blindness, not recognizing in Christ the Savior and Son of God; it approached His meekness, humility, patience, purity, and holiness with the darkness of temptations woven from pride, betrayal, conceit, and lies. But sinless Christ God, Who needed no purification, opposed the tempter with fasting and prayer, showing all of us who follow Him the path of struggle with sin. And the Lord confirmed by word and deed that this kind goeth not out but by prayer and fasting (Mt. 17:21). By prayer and fasting, the Christian receives the strength of the Spirit from the Lord for his struggle with the enemy; through fasting and prayer he receives the gift of discernment and the mind of Christ; prayer and fasting lights the light, which disperses the darkness of sinful life, for, The light shineth in darkness; and the darkness comprehended it not (Jn. 1:5). But by his will, man chooses between a path of corruption and incorruption, good and evil. If woe, suffering, and death entered life through the sin of disobedience to God, then only through obedience, prayer, and fasting—our living sacrifice of love for God—can the light of supreme righteousness, peace, and joy return. And this, my dear ones, is paradise on earth. However, according to God’s commandment, love for God on earth manifests only as love for people. The heart of a Christian can warm itself and burn only with a two-in-one love for God and people simultaneously. If our heart is hard and cruel toward our brother, to man, then darkened by dislike, coldness, and cruelty, it becomes indifferent or hypocritical toward God. And paradise, which could have been so close—in our heart—leaves and fades, and the sin of lack of love gives birth to disobedience, conceit, and self-love. —you are someone’s enemy—you have offended someone, had contempt for someone, humiliated someone. You yourself need forgiveness, you need condescending love. The words of today’s Gospel also resound: For if ye forgive men their trespasses, your heavenly Father will also forgive you: But if ye forgive not men their trespasses, neither will your Father forgive your trespasses (Mt. 6:14-15). Forgive everyone everything, and you will be forgiven. Forgive, and you will be saved, and you will inherit paradise. Following immediately after these words of the Lord about forgiveness are these other words: Judge not, and ye shall not be judged (Mk. 7:1). In these words the Lord shows a very short and most sure path to salvation, which opens to us the gates of the Kingdom of Heaven. The Lord shows us that virtue, without which all our ascetic labors and efforts in life in general, and during the Great fast in particular, will be in vain. Furthermore this is the only path—the path of love for people, beginning with non-judgment. Judge not, and ye shall not be judged… In His first Coming, the Lord came not to judge the world, but to save it. He came to open locked paradise to it. After all, God gave all judgment to His Son at the Second Coming; but for now, mercy rejoiceth against judgment (Js. 2:13). Now is yet the time of God’s mercy. God still has mercy on us, but we judge and enforce. Having no doubts at all, we lift ourselves up in opinion and judgment over our neighbors, both near and far, small and great. We judge when we know much; we judge when we know nothing at all; we judge from other people’s words. Just think, my dear ones, our judgment, as the judgment of an enemy, extends even to the Savior Himself. A person has sinned before God, before people, and we are witnesses of it. But we did not see how he repented, and we did not hear the priest’s consoling words pronounced over his head: “And by the authority given to me, I forgive and absolve all your sins, in the name of the Father, the Son, and the Holy Spirit.” God’s mercy has already erased the handwriting of sins, but we continue to remember and judge. This is no longer judgment over a man, but a judgment over God, Who has been merciful and forgiven. Thus, we perish by judgment. For where there is judgment, there is no love. Only love is capable of being at all times an advocate, and only love can cover our brother’s nakedness. But we judge! 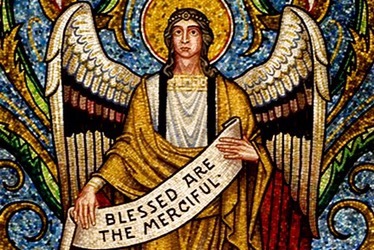 And this judgment becomes our own condemnation and sentence, which sounds like this: For he shall have judgment without mercy, that hath shewed no mercy (Js. 2:13)! And paradise cannot receive us, for we have no love in us. Where there is no love, there is no salvation. Today, beginning with the podvig of Great Lent, let us, friends, resolve two major spiritual lessons: do not judge and do not tempt! So that we might root ourselves in saving, blessed non-condemnation, that we might place a beginning of this podvig during the very first days of Great Lent, we must learn to see, judge, and condemn only ourselves—the only person that we truly know, from all sides and deeply. This is where judgment without mercy will be unto salvation; for this is the only judgment that will lead us to true reason. It gives us a vision of that abyss on the edge of which we stand, and which we dig out by our sins, our debts to God and people, and by our condemnation of others. This judgment of ourselves will tear a living, saving cry from our hearts that will reach the heavens: “Lord! Have mercy on me. O God, be merciful to me, a sinner!” And the miracle of our salvation will begin. The Lord will console our repentant souls and hearts with peace, calm, and love. In the words of our dear elder, St. Seraphim of Sarov, “Acquire the spirit of peace, and thousands will be saved around you”—transformation will begin in life around us. “Now is the spring of the soul!” Holy and Great Lent is at the doors. May the seed of our repentance and prayer sprout forth by it, and produce the saving fruits of our soul’s resurrection in God. This is the Christian fast, which the Lord expects of us. Our friends, let us enter the Great Fast, let us enter the field of its ascetic labors—repentance, temperance, and humility—and confirm ourselves in them; so that having received forgiveness, we may meet Christ’s resurrection, Holy Pascha—the heavenly radiance on earth. Previous Previous post: John Stamos to Appear on Who Do You Think You Are?